You can record narration for a presentation right within PowerPoint. To record and play back sound, your computer must be equipped with a sound card, microphone, and speakers. Make sure that you aren't running any other sound recording applications, such as Speech Recognition, while you are recording. Type a name for your audio segment, select Record , and then begin speaking. Note: Your device must have a microphone in order to record audio. To review your recording, select Stop and then select Play . Plays the audio file automatically with a click. Plays automatically once you advance to the slide that the audio file is on. Plays audio only when the icon is clicked on. Loop until Stopped: Plays an audio file repeatedly until it’s stopped manually by clicking the Play/Pause button. In the navigation pane, click the slide that you want to add sound to. On the Insert menu, point to Audio, and then select Record Audio. To start recording, click Record . When you are finished, click Stop . To listen to the sound that you just recorded, click Play . In the Name box, type a name for the sound, and then click Insert. An audio icon appears on the slide. Determine when the audio clip should start playing: In the Start list, select Automatically or When Clicked. To play the audio clip as you click through the slides in your presentation, select Play Across Slides. Select Hide During Show if you want the audio icon to be invisible during Slide Show. On the slide, select the audio icon, and then click the Play/Pause button beneath the audio icon. Important: Use this option only if you set the audio clip to play automatically. Note that the audio icon is always visible unless you drag it off the slide. On the Home tab, under Insert, click Media, and then click Record Audio. In the Name box, type a name for the sound, and then click Save. 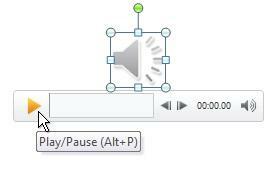 On Click: During the presentation, the audio will start when the audio icon is clicked. Play Across Slides: By default, the audio stored on a slide stops when you transition to the next slide, but this setting allows the audio to continue to play. (This setting can be paired with Playback Options = Loop Until Stopped if you like. On the PowerPoint ribbon, on the Format Audio tab, open the Playback Options list and select the Hide Icon During Show check box.